Yields: Serves 2-4. Batch makes two pies of 6-8 slices. 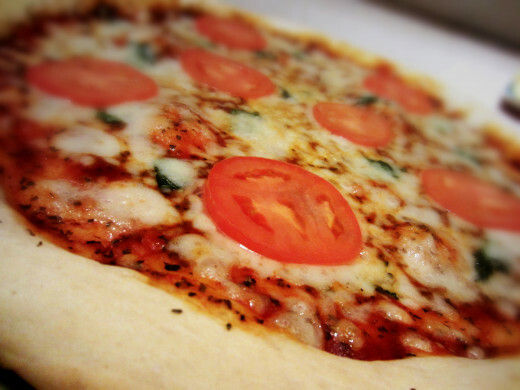 One of my favorite foods is homemade pizza. I have been eating it all my life. My parents, who have been married for almost 40 years, make pizza from scratch every Saturday night. So it's safe to say that they have perfected the recipe! Making the dough from scratch is a little tricky so don't get discouraged if it doesn't work well the first few times. I will tell you that the water temperature is VERY crucial to this process. Save Cash, Buy in Bulk! It takes time to perfect a batch of perfectly rising dough that will bake just right, so be patient. It took a bit of trial and error on my part. The aim is for the baked crust to be light and crisp on the outside yet soft and springy on the inside. 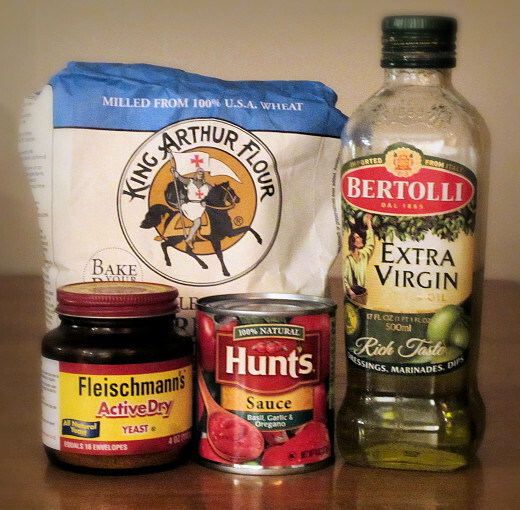 In a large bowl combine the active dry yeast, sugar, olive oil, and salt. Pour the warm water over contents in bowl and stir together briskly with a spoon until the yeast has dissolved. Be sure the water is at or near 110° or at least within the range of 105°-115°, anything too hot or cold may disrupt the process. Use a thermometer to be sure (I've learned to just use my fingers). Next, start adding bread flour one cup at a time stirring as you go. 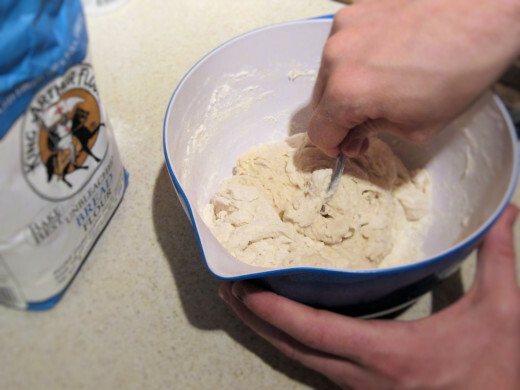 Once you add the fourth cup of flour, begin kneading the mixture together in the bowl with your hand. Continue to knead the mixture for one to two minutes into the shape of a ball. It won't be perfectly smooth, but that's ok. Do not over-knead, it just has to hold together. 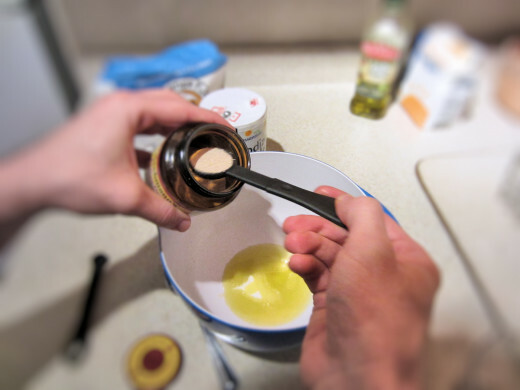 Remove the dough ball from the bowl and, using olive oil, grease the inside of the bowl as well as the dough ball itself. Place the greased dough ball back in the bowl and cover the bowl with plastic wrap and a towel to keep air out and seal in warmth. Set covered bowl someplace at room temperature where it will not be disturbed. I usually place it in a cool oven, just make sure to remember it's in there. 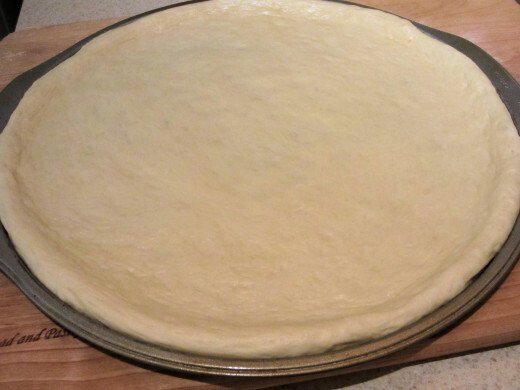 Allow the dough to rise for approximately 45 minutes to an hour depending on room temp. It should be double in size when ready. Once dough has risen, sprinkle a clean surface with flour and apply some olive oil to your hands to avoid sticking to dough. 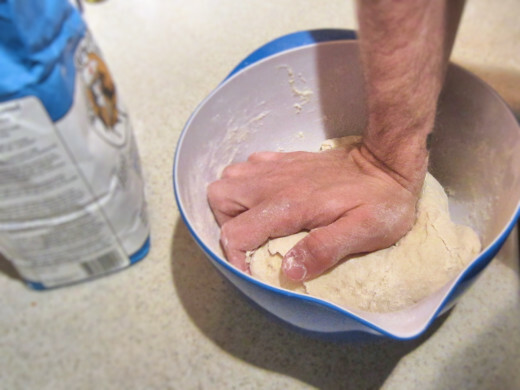 Remove dough from bowl and begin to knead it by gently stretching it forward with one hand, fold it over, then rotate it and repeat. Try to form a nice smooth ball. I usually knead the dough for about 3-4 minutes. I've found that kneading it longer tends to make the crust too dense. 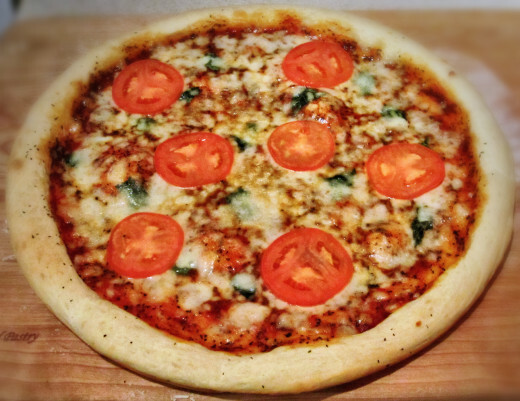 After you are finished kneading the dough, you will want to cut it in half so you will have enough for two pizzas (unless you are making one really large pie!). The pan size I use for the pizza is a standard 14". If you only plan on making one pie, you will need to store the other half. Rub a liberal amount of olive oil on the dough you plan to store and place it in an extra large zip-lock bag or in a large oiled bowl covered with plastic wrap and place it in the fridge or freezer. The container must be large because the dough will continue to rise. If it will be a few days before the next use, you can always freeze it. When you are ready to use the dough, let it sit at room temperature for two hours if refrigerated and several hours if frozen. Preheat your oven to 400° and start prepping the toppings of your choice. 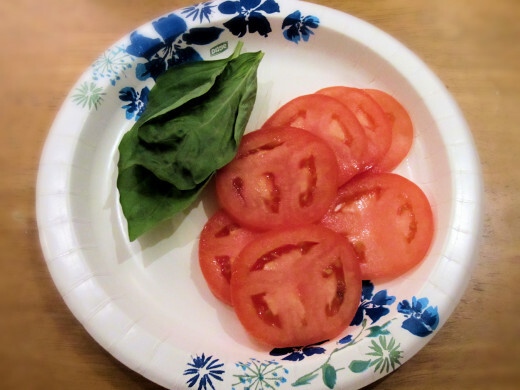 Personally, I like to keep it simple so I just use fresh mozzarella that I grate myself, some fresh basil, and sliced roma tomatoes. For the sauce, just take an 8 oz can of Hunts sauce, pour it in a bowl, and add the onion and garlic juice, some oregano, and stir. 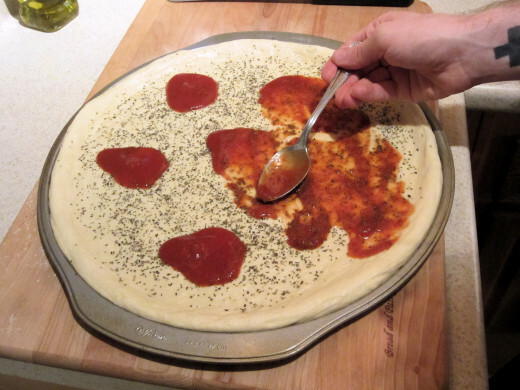 NOTE: I use about five tablespoons of sauce for my pizza, but you can use more or less depending on your preference. Once you have all your toppings ready to go, it's time to put everything together. If you have a new pizza pan, you most likely won't even need to grease it or anything, however, over time the pan will lose it's coating and the dough will begin to stick, so I liberally grease the pan just to be sure. Better safe than sticky! 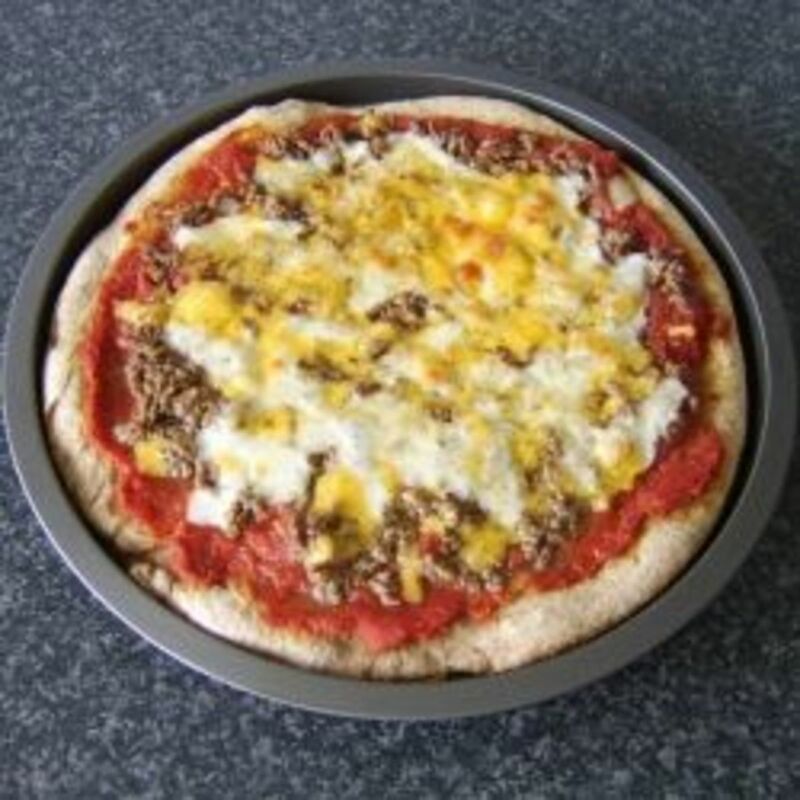 Sidebar: I have wanted to try using a pizza stone as an alternative to a pan, but haven't had the chance. I will let you all know once I've given it a go! 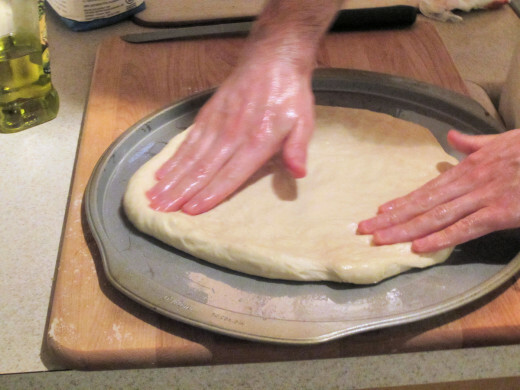 Alright, so go ahead put the dough on the pan and gently start pressing it out towards the edges with your fingers. Start in the center and just work your way around it evenly, don't force it or it will break. This process can be frustrating (it was for me at first) because the dough can be temperamental at times. Your goal is to have a nice rim that will become the outer crust. 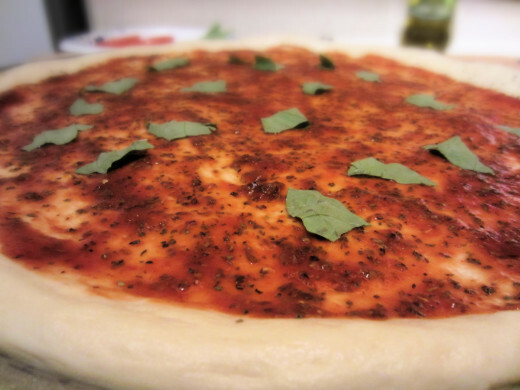 You can start adding sauce now if you like, but I like to first sprinkle the surface of the dough with dry basil, it adds to the flavor. Now add the sauce over top and add a few torn pieces of fresh basil (did I mention I like basil haha), then sprinkle on the mozzarella and place the sliced roma tomatoes on top. 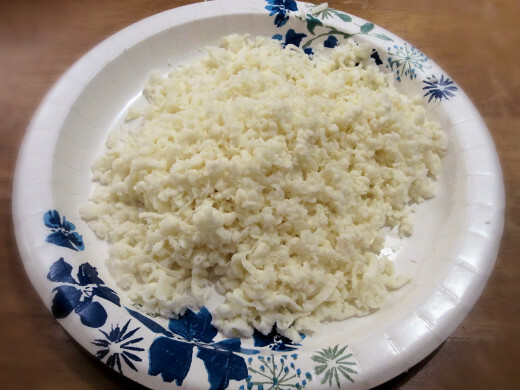 Some people like to add thick slices of fresh mozzarella as well, but I like to keep things as simple and inexpensive as I can. If you're happy, then you're done. 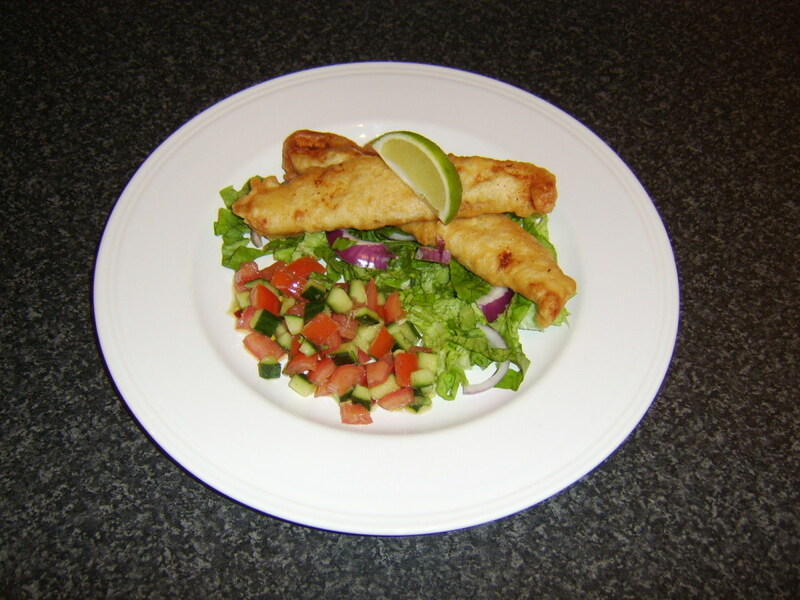 Place it in the oven for about 10min, or until the cheese is melted with a few golden spots. 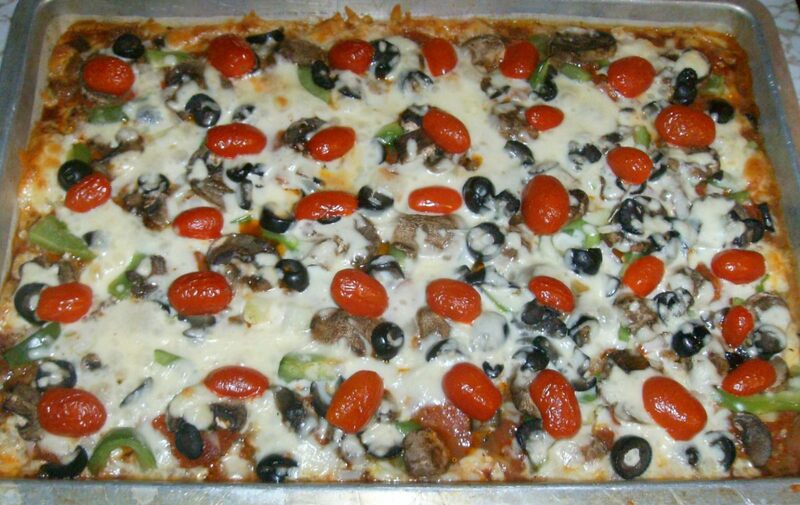 Remove the pizza from the oven and carefully take the pie off the pan and let it cool on a cutting board or cooling rack. And there you have it! Cut and serve! How About Some Coffee or Dessert? Fast and easy homemade chocolate chip oatmeal cookies made with coconut oil. 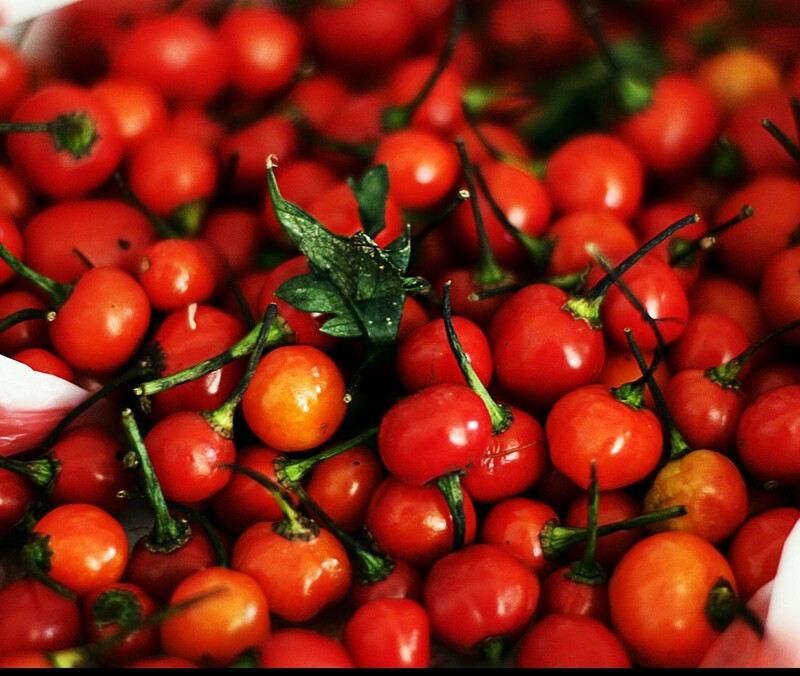 They are so chewy and bursting with flavor! 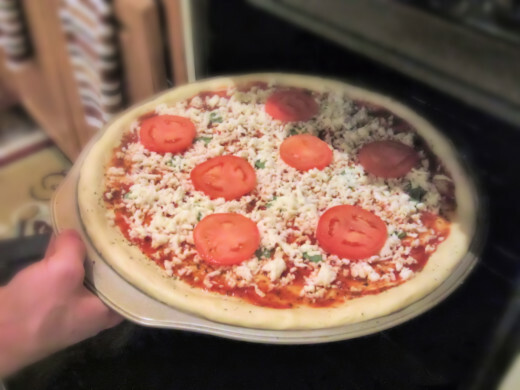 Wow, this pizza recipe looks really good. 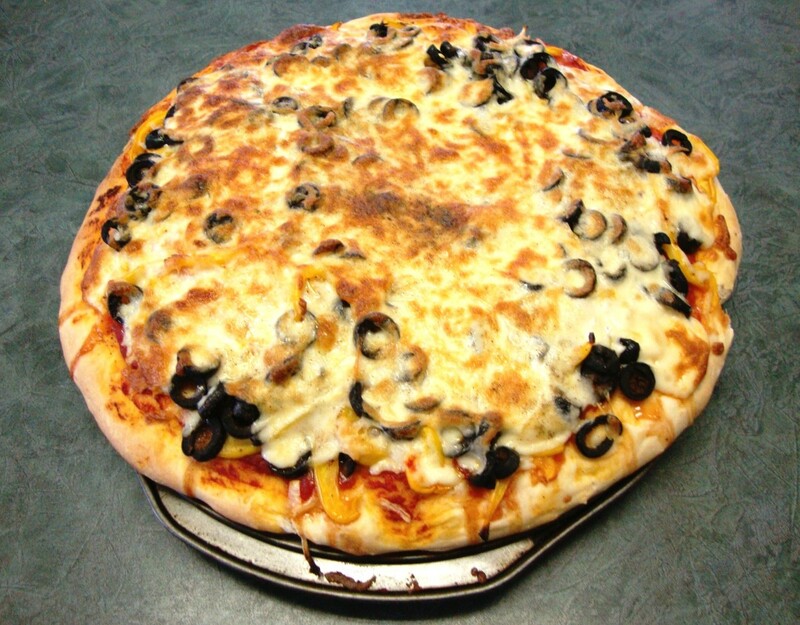 The images of the pizza make it look so delicious and yummy. 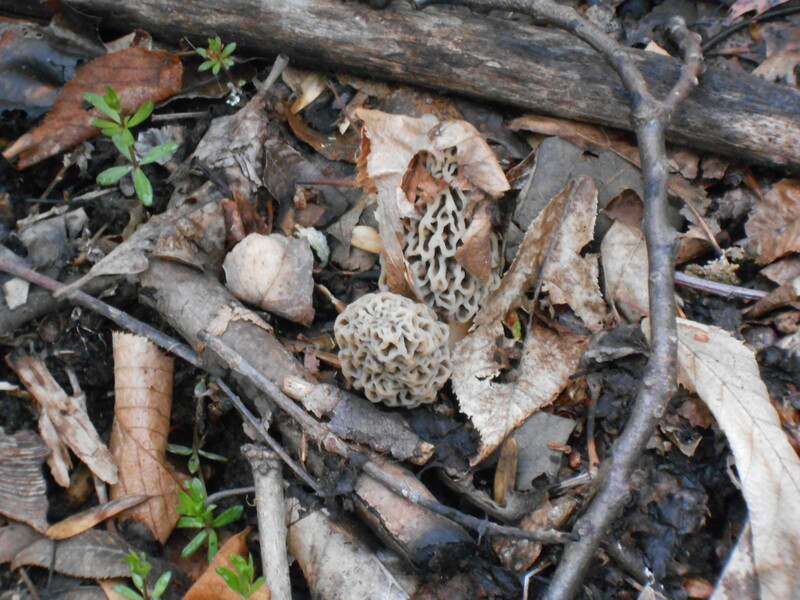 Now I want to have some. Thank you so much pstraubie48! I hope it turns out as wonderfully for you as it did for me. If you have any questions, feel free to ask. This looks yummy. I have just within the last year learned to make the dough work for me. For years I was so intimidated, every batch was disaster. I cannot wait to give yours a try. And the simple ingredients for toppings is perfection.